Mulch is what’s made from your Christmas tree. So, when you’re ready to haul it away, the closest city of Omaha Xmas tree drop off site is Tranquility Park | 120th Street & West Maple Road. North lot of soccer complex. Site opens on December 24 and close January 6, 2015. No hours of operation are listed for Tranquility Park on the city of Omaha website, at this time. Omaha’s Tranquility Park Christmas tree drop off site does not accept wreathes and evergreen roping. Thumbs up to flocked trees – are permitted. Please throw trees up toward the pile. 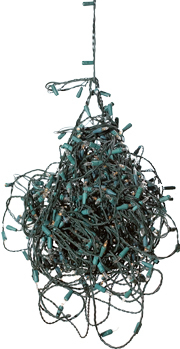 Worn Out Xmas Lights & Extension Cords? Drop off old holiday lights and cords for recycling to benefit the Susan G Komen Nebraska foundation. Happy Holidays. Merry Christmas. Happy New Year! Next ECC Easter Egg Hunt Saturday April 4th: 11 a.m.